Curiosity, optimism, passion, courage, creativity, independence, sense of humour, reliability, generosity, confidence and harmony are the 11 qualities that make up a successful individual. 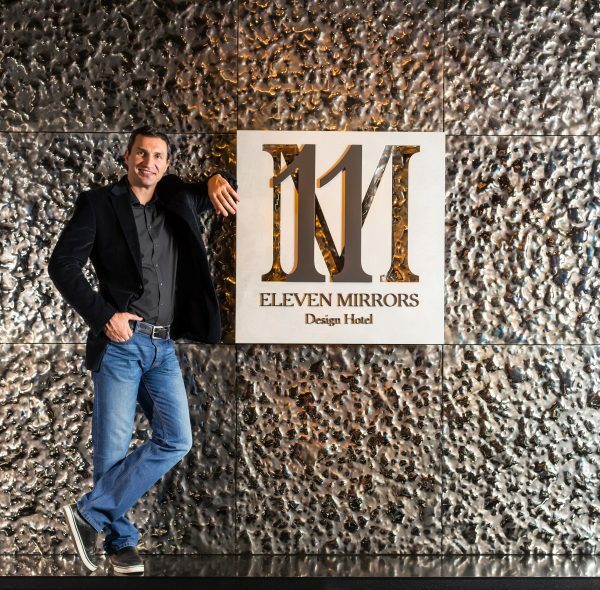 At least, in the eyes of the two men behind the 11 Mirrors Hotel, boxing legend Wladimir Klitschko and successful real estate developer Ruslan Oleksenko. These two successful professionals created this hotel on the back of their hectic travel schedule, and logical understanding of the comfort and practicality such travelling professionals need, as well as a respect for the very successful qualities that make up the individuals that demand it. 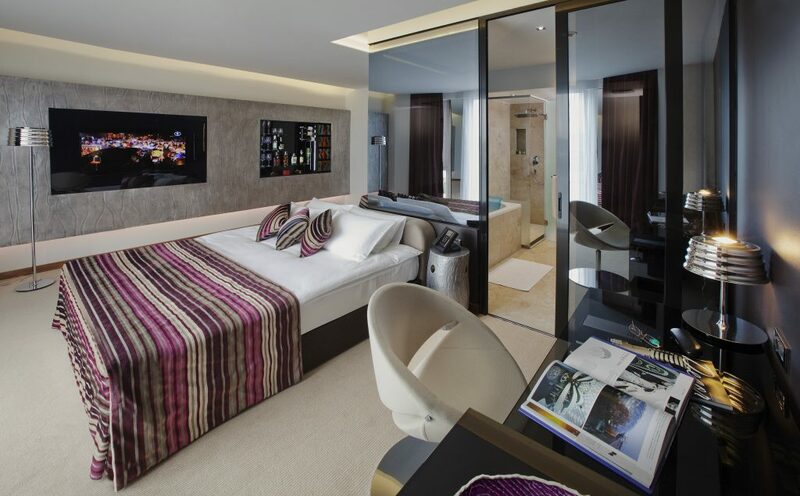 This luxury boutique hotel was thus born, permeated with the most avant-garde design, whilst perfectly located in the heart of old Kiev just across the street from the grand National Opera House, main shopping district, and city’s business centre. 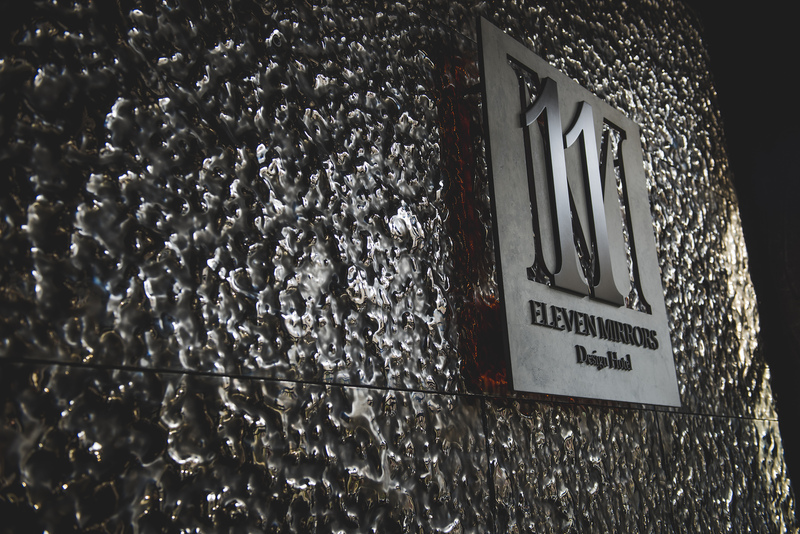 In manner of a true boutique hotel, 11 Mirrors evidences contemporary design at its finest as a sleek black, silver, and deep purple hued cocoon in the city centre littered with mirrors and reflections that create a somewhat surrealistic experience. 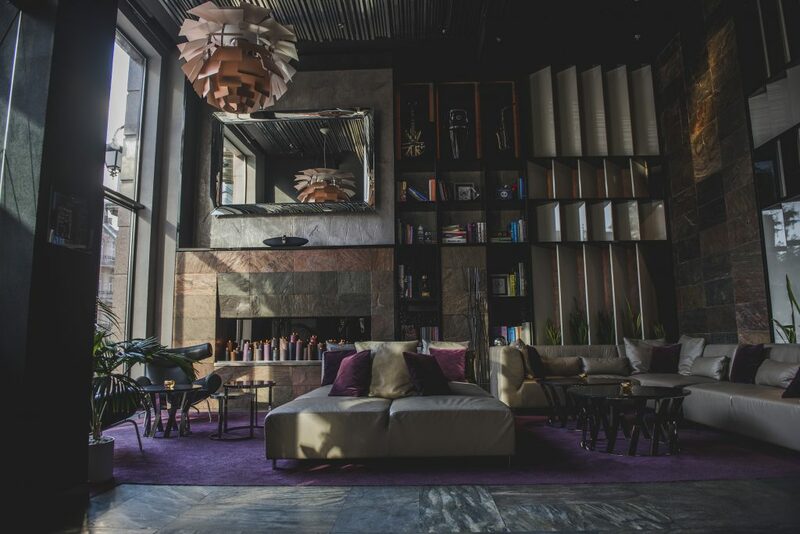 One would be hard pressed to find a more hyper-modern hotel in old Kiev, yet it’s perhaps this sense of originality and independence that so defines both its interior and ideology that makes it so attractive. Just as an individual with these 11 qualities must stand out in society for their success, so does this hotel, a unique gem amidst the hum drum of corporate chains and 5 star global giants. 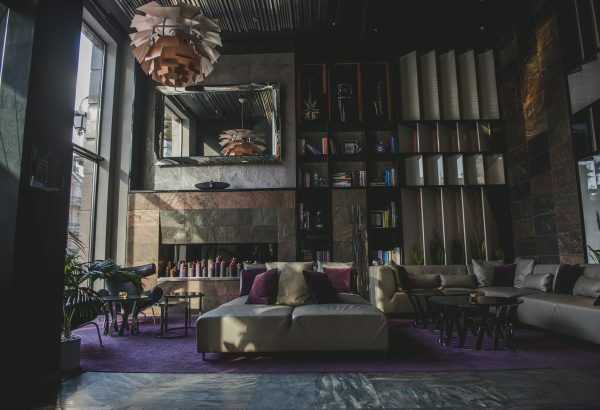 Despite its sleek and ultra-vogue, glossy interiors, the hotel, tucked in neatly on Bohdana Khmelnytskogo Street between designer stores, is a haven of Ukrainian warmth and heartfelt hospitality. With 49 modish rooms and suites, ranging from the Incognito Superior Room, Desire DeLuxe Room, Signature Premium Room and unusually large Lifestyle Executive Suite, a small restaurant and intimate lobby library area, the hotel is surprisingly intimate and inviting. It was a snow-filled Friday evening in March (!) that my guest and I decided to stay here, on my first trip to Kiev. Checking in somewhat late at 8pm, we were ushered in from the snow storm outside by the kind footman, and greeted by the gentle and welcoming Tetiana, who gave us our room keys for the 6th floor. My guest for this stay, was my father, and it feels worth mentioning that she advised us to take two separate rooms, rather than a twin bed, since the ultra modernistic nature of the rooms means their walls are see-through ‘mirrors’ in the en-suite bathrooms, intimacy and progressiveness emerging as the hotel’s ubiquitous themes. 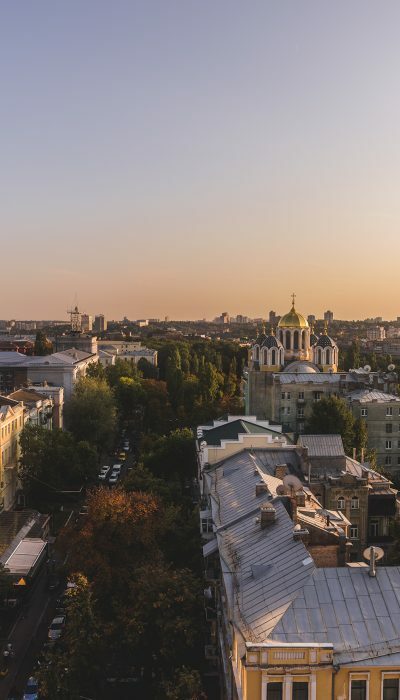 Each Signature Premium Room comes with a gloriously wide, panoramic window that opens up to generous view over Kiev’s snow-lined streets, with a grandiose cathedral in the distance looping over the city’s rooftops. My room was large, a solid 39 sq metres (a very decent size for two), with a spacious heated-floor bathroom that had an oversized bathtub, walk-in shower for two, and selection of natural cosmetics by Pure Herbs. The heated flooring was particularly welcoming after the -16c streets outside (and made a fitting space for drying our snow-ridden clothing), whilst the shower pressure was excellent for the massaging, de-stressing, and de-frosting process I needed after braving the blizzard outside. 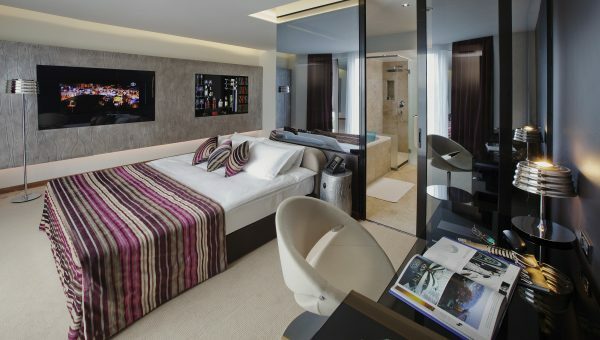 In the room itself, was an ostentatious open bar with selected drinks, as well as a more conventional mini-bar fridge, ginormous LCD TV embedded into another wall mirror frame, and extremely comfortable, giant, king size bed. Aside from the 49 ultra-comfortable rooms, are a number of services, including the normal 24 hour concierge, 24 hour room service, 24 hour security, business centre services, high-speed Wi-Fi, daily housekeeping, turndown service, laundry, dry-cleaning and shoe shining, iron and ironing board, cab service and full accessibility for all guests. There is also a fitness centre and spa at Leonardo Wellness Club, the nearest and arguably best wellness and spa centres in the city. It’s not quiet free for guests but does come with an exceptionally discounted rates for those that want to work out or unwind. 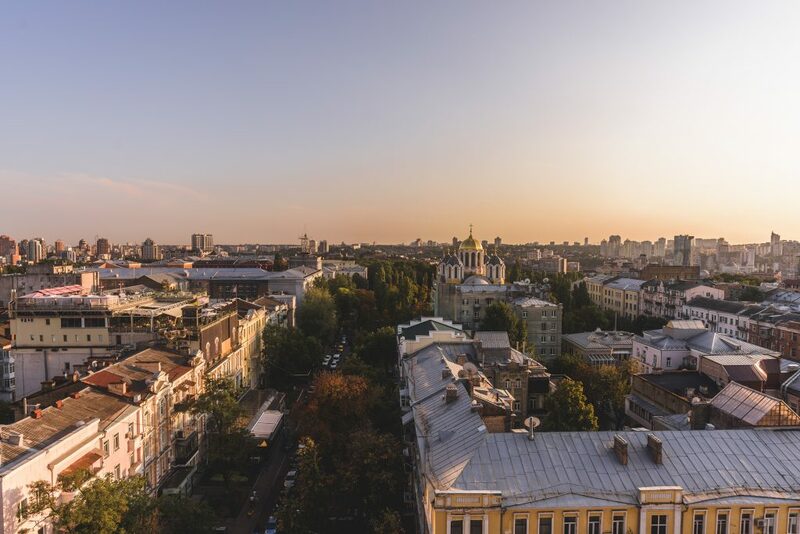 Spending two days and nights in Kiev, we decided to dine at the hotel on our second evening, and explore local cuisine on our first. Both nights we retired to our rooms somewhat late and tired, and were delighted to find them toasty on arrival with a serene quietness from the hustle and bustle outside (the complimentary earplugs in each room were, thankfully, unnecessary). 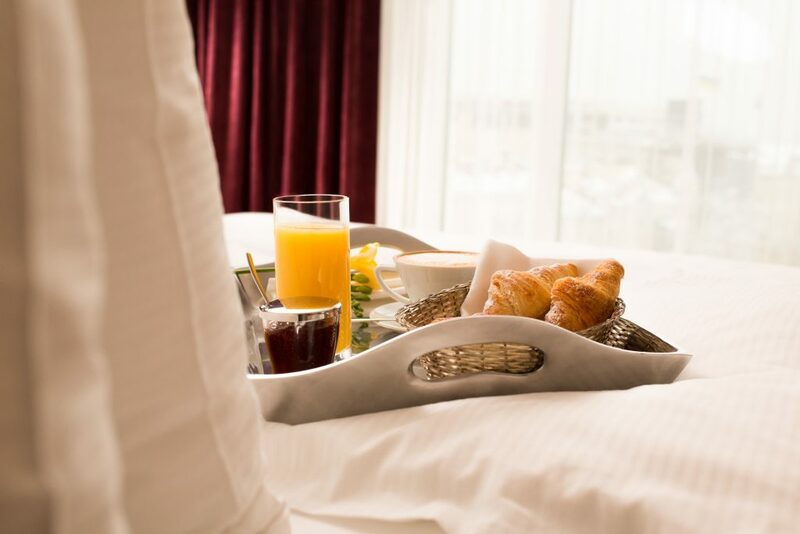 We slept well and peacefully both nights, and, since it was weekend, were able to lie-in quite generously before descending to the hotel restaurant for the late breakfast that was served at 7.30am – 12pm. Breakfast was, perhaps, the most unexpected delight of the hotel. 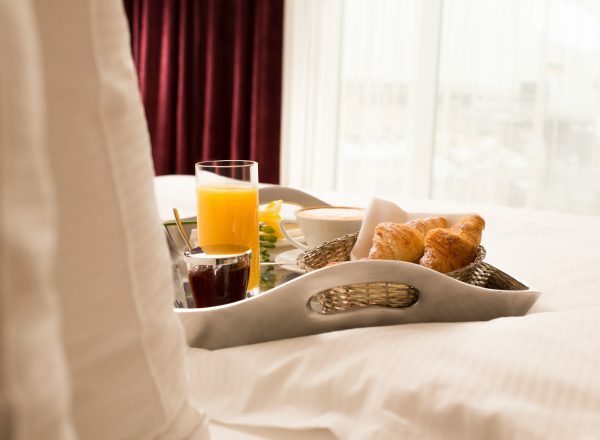 A far cry from the stale selection of croissants and continental cereal bars of the larger chain hotels, 11 Mirrors breakfast selection is as unique as its interior. On the mornings we dined, the range, though seemingly small, was surprisingly vast, offering everything from fresh fruit and vegetable salads, to smoothies, fat free yogurts and mueslis, as well as a variety of wholegrain breads, pastries, and dried fruit. There was also a selection of hams and cheeses, the most delicious smoked salmon I have tried in a while, smoked salmon pie, eggs, and salamis. The cooked breakfast was the real charm, though, with a hearty range of omelettes, fantastically creamy scrambled eggs, sausages, roasted vegetables, a warming ratatouille-esque bean dish, as well as pancakes and sweeter items. There was also, somewhat oddly, cheesecake (which my father thoroughly enjoyed and tried to enforce upon me). With everything tasting fresh and flavoursome, the ingredients’ quality made plain the excellent standard of the breakfast and on both days, it was likely my favourite meal. The coffee was also surprisingly fantastic, akin more to that of an independent coffee specialist than a downtown hotel, and the freshly squeezed juices were also an unexpected delight. It’s hard to fault this hotel. After two busy days fighting the -19c winds and snow storm outside, it proved a heart-warming cove of generous and personable service, stellar facilities, fantastic food, and inspiring aesthetics – all whilst remaining a small and intimate space in the heart of Kiev’s downtown. Everything was truly up to what would be a 5 star standard, without the monotonous predictability of a larger chain. 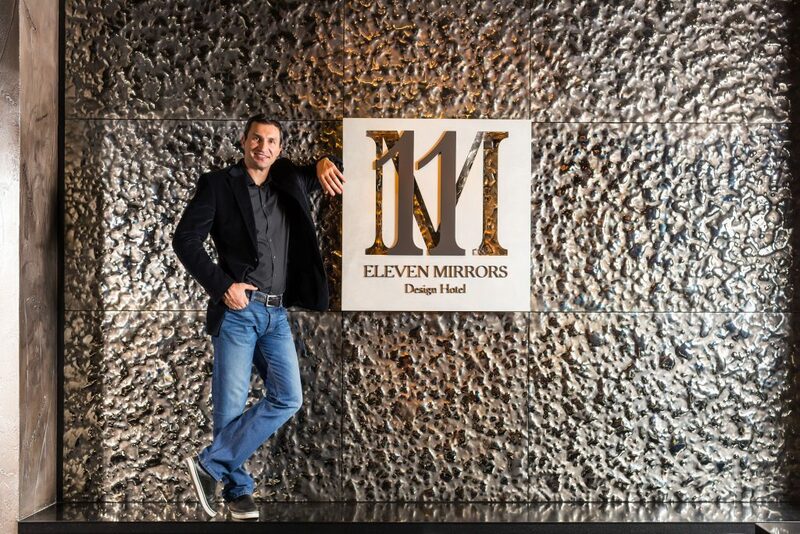 If you are looking for a restful and warm place to stay in Kiev, try the 11 Mirrors Hotel. Its as consummate as the combination of 11 qualities that it bases itself on; you will not be disappointed.